“They let grown-ups in the bounce house?! ?” Mention FriendsWithYou’s Rainbow Village, now anchoring the recent expansion of the Highline to 30th Street, and that’s likely the response you’ll get. It might be difficult for some to wrap their head around, but it is, indeed, true. Adults can kick their heels off, shed their ties and climb into an over-sized mushroom to jump until their hearts are content, forgetting instantly that their Midtown offices with overbearing bosses and ringing telephones are mere blocks away. If there’s one thing that Sam Borkson and Arturo (Tury) Sandoval III – collectively known as FriendsWithYou – excel at, it’s providing an escape from the ordinary. Since the Miami duo joined forces in 2002, their sole mission has been to infect the world with unapologetic enthusiasm. And, through an inspired cast of imaginary characters, geometric design and bright, primary colors, they’ve done exactly that. From collabs with Kid Robot, Nike, MTV, Sanrio and Scion to solo exhibitions in major museums throughout the world, FriendsWithYou has become one of the most recognized collectives in the art world. Most of this is accomplished through a vast network of friends, making their efforts all the more admirable and pure. All good things must come to an end and the same goes for Rainbow Village. 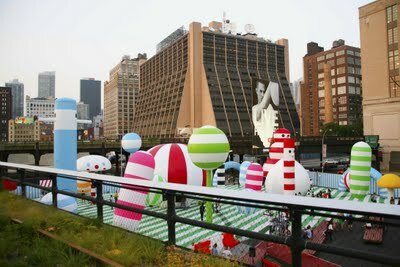 Though the AOL Artist installation on the Highline will deflate on July 5, FriendsWithYou’s first solo show in New York, entitled “:)” is open until August 5 at Hole Gallery (312 Bowery Street). Inside you’ll find the same creative manipulation of shape and color infused with a sense of childlike abandon on a smaller scale. Thank sponsor Native Shoes by stopping by their pop-up shop next door and copping a pair.